Grow in the grace and knowledge of our Lord and Savior Jesus Christ. To him be glory both now and forever! No matter how much we might want to try and stop it, kids grow up. They get older, wiser, taller, faster, and bolder. It’s a fact of life: kids will grow up. We are the proof of that aren’t we? The kids in our classroom are going to grow while they are in our care, too. They will be able to do things at the end of their time with you that they were not able to do in the beginning. And they will grow in their faith as we teach them about Jesus. What a joy to watch these children in our care grow! You and I have some growing to do, too. Peter encourages us, “Grow in the grace and knowledge of our Lord and Savior Jesus Christ.” We who teach can grow as we learn more about our Savior. Through our personal devotions, going to church, attending Bible study, teaching God’s Word, and more, we will grow in the grace and knowledge of our Savior. 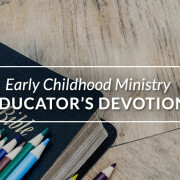 Growing in grace and knowledge and teaching others to grow can be hard – especially when a teething toddler is throwing a tantrum or a feisty five-year-old is fighting. But God’s message to us is clear: Jesus is our Savior from sin, death, and the devil. So as we grow in grace and knowledge we will live every day in a way that shows our love and thankfulness for this free gift of grace. This gives him glory. Grow in grace, dear Christian friend. Grow in faith. Grow in wisdom. Grow in compassion as you teach children in your care to grow in grace… and that will give God glory now and forever. Prayer: Dear Jesus, be with us as we grow in your grace. Keep us strong and steadfast in your Word. Grant that all we do in our classrooms brings glory to you. In your name we pray, Amen.